This has a few steps I would not normally bother with, however 3 days a week I work 8am-7.15pm and I want my make up to stay all day. These '25 hour wear' foundations just don't cut it, I don't want to look cakey - just all day flawless (not asking much). So if you like a seriously hard working base or work long days like me this just might help. First I prime using Mac's Prep + Prime Natural Radiance in yellow. I like this primer as it extends my foundation wear and helps to neutralize redness, I follow that my a generous spritz of Fix+. The foundation choice is currently Light Wonder by Charlotte Tilbury, I'd much rather build light layers then slap on something full coverage and the colour match is on point (shade fair 2). 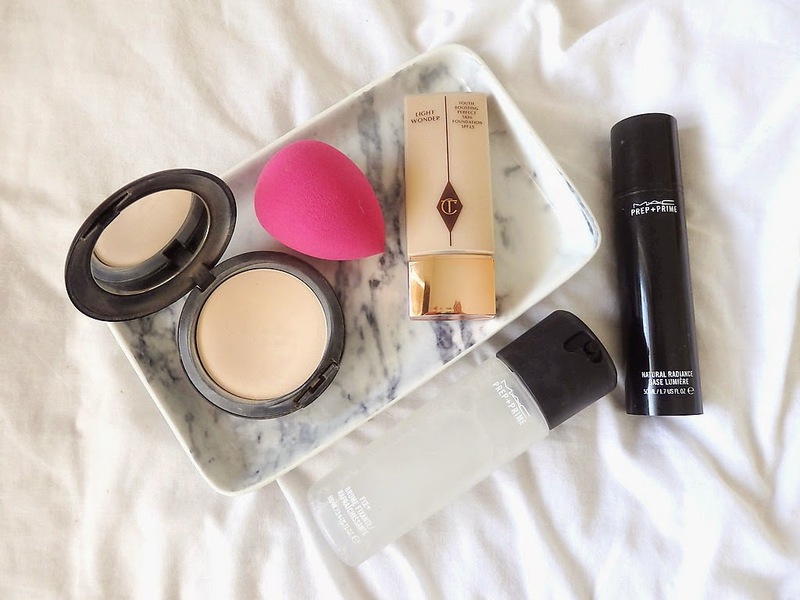 After any necessary concealing I spray a beauty blender with Fix+ then use to apply Mac's Studio Fix Powder in NW15, I bounce this over my t- zone to really lock it in. This doesn't look over matte due to the beauty blender and really does keep everything in place, I finish everything off with a final spritz of Fix+ and I'm done. A base that needs light touch ups and still looks half decent 14 hours in? Done.